An image is divided into pixels (Short for Picture Element), each pixel represents the smallest single point on the screen. A pixel can only be one colour at a time, and when a picture is saved, the colour of each individual pixel must be stored in binary. The more bits that are used to store each pixel, the more colours are potentially available. VDUs display output using millions of pixels. 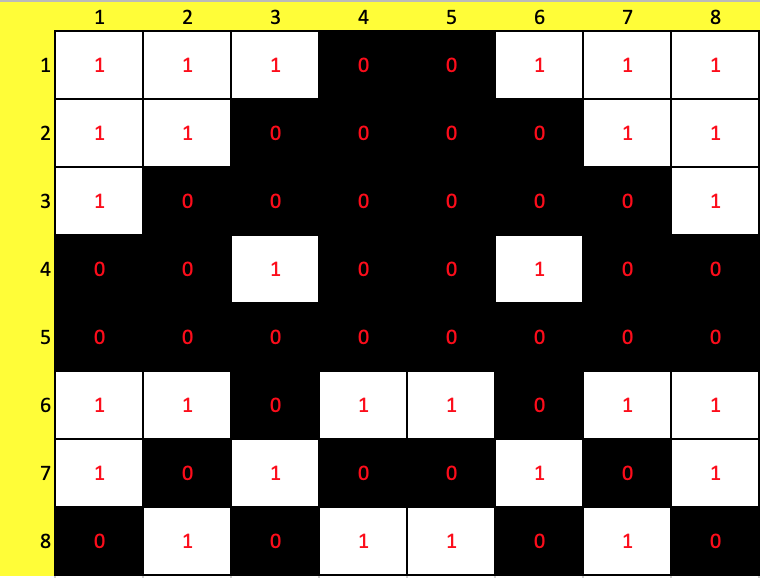 Each pixel is represented by a number of bits and programs can specify where each pixel is placed on the screen and what colour it is going to be. An image represented this way is called a Bitmap. The following 1-bit image shows how pixels are made up of binary code. The digit 0 is used for Black and the digit 1 is used for White. In reality, images are far more complexed than the image shown, with colour depth and image resolution having a big impact on the quality and file size of an image. The image above (Which has been enlarged) is 8 pixels by 8, so 64 pixels in total. Only black and white are being used, so a single bit would be enough to store each pixel. Using 0 for black and 1 for white we would use 64-bits or 8-bytes to store the pixels in this image. The number of bits per pixel is referred to as the Colour Depth. It is important for the quality of the colours in an image. If 1-bit is used to encode each pixel, then only two colours can be used (21). As we mentioned before, the 0 represents black and the 1 represents white. To be able to represent more than two colours in an image, each pixel requires more bits. To work out the minimum required colour depth from the number of colours in the image, convert the number of colours to a power of 2. A 1-bit image can display 21, or 2 colours. A 2-bit image can display 22, or 4 colours. A 3-bit image can display 23, or 8 colours. A 4-bit image can display 24, or 16 colours. A 5-bit image can display 25, or 32 colours. A 6-bit image can display 26, or 64 colours. A 7-bit image can display 27, or 128 colours. A 8-bit image can display 28, or 256 colours. A 16-bit image can display 216, or 65,536 colours. If the colour depth is increased, more bits are used to represent each pixel, and the overall size of the file will increase. 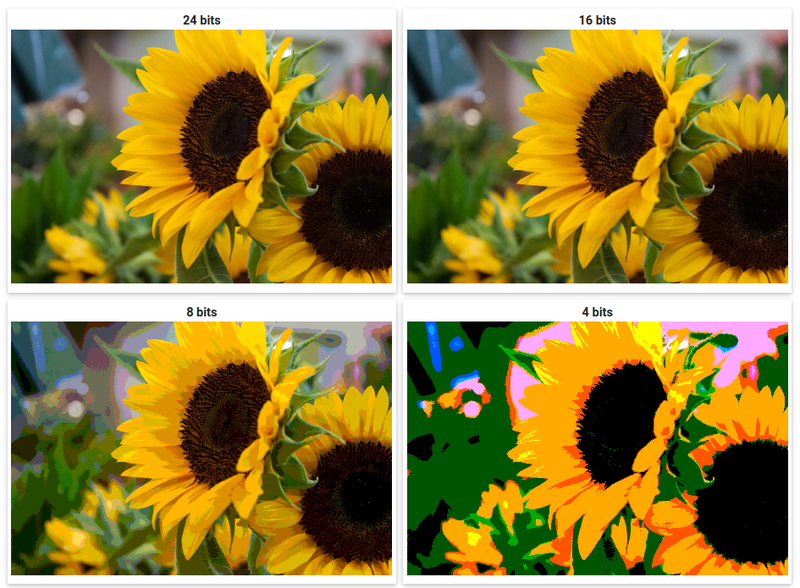 The following image demonstrates how the quality of an image changes depending on the number of bits used. (a) Convert the following binary data into a 5 x 5 pixel image, where 0 represents black and 1 represents white: 11111 00100 00100 00100 00100. 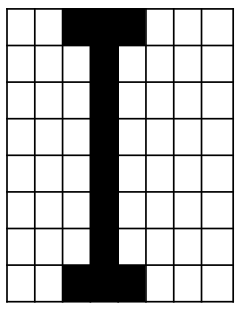 (b) Convert the black and white image below into binary data, where 0 represents black and 1 represents white. Resolution is the number of pixels (Picture Elements) or dots (Dots per inch - dpi) that make up an image. The greater the number of pixels per inch —> the sharper the image will be, the greater the quality and the larger the files size of the image. 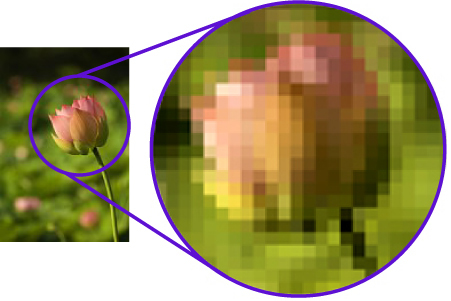 Pixel density is measured in pixels per inch (PPI) and is used to describe the resolution of a computer screen, camera or scanner. The file size of an image depends on the colour depth and the number of pixels in the image. W ---> The width of an image, measured in pixels. H ---> The height of an image, measured in pixels. D ---> The colour depth; the number of bits used to store each pixel. To convert file size from *bytes* to *kilobytes*, divide the number of bytes by 1,000. To convert from *bytes* to *megabytes*, divide the number of bytes by 1,000,000. An image captured in 128 colours, with a size of 2,000 pixels by 1,000 pixels, is saved on a memory stick. What is the size in bytes/MB of the file? (a) Define the term Pixel? (b) Calculate the size in bytes of a black and white image that is 96-pixels wide and 1,024 pixels high. (a) An image captured in 512 colours, with a size of 3,100 pixels by 2,000 pixels. (b) An image captured with a colour depth of 24-bits, with a size of 4220 pixels by 2641 pixels. (c) An image captured in 256 colours, with a size of 640 pixels by 480 pixels.